The best option would be a wired network, but in the case you cannot wire each AP, the point-to-point wireless bridge is the best performing option for your case. A point-to-point bridge can solve the problem of bringing Internet to an access point that cannot be wired to a gateway. In this example, you have two Nanostations with the original Ubiquiti firmware, configured to create a 5GhZ wireless backbone. You should choose the device (Ubiquiti Nanostation M2, or M5, or others) depending on the distance that you should cover. Basically, the bridge is a substitute for the cable – this means, that you can connect any access points to the Internet without wiring them, included the Tanaza Powered Access Points. 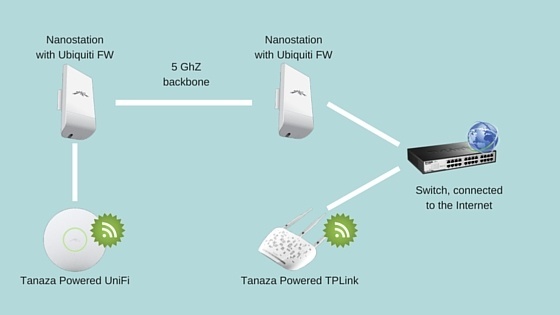 Thanks to this configuration, you have a high-performing network without connectivity issues, and you can cloud manage some of the access points and the SSIDs / splash page through the Tanaza Cloud Dashboard.